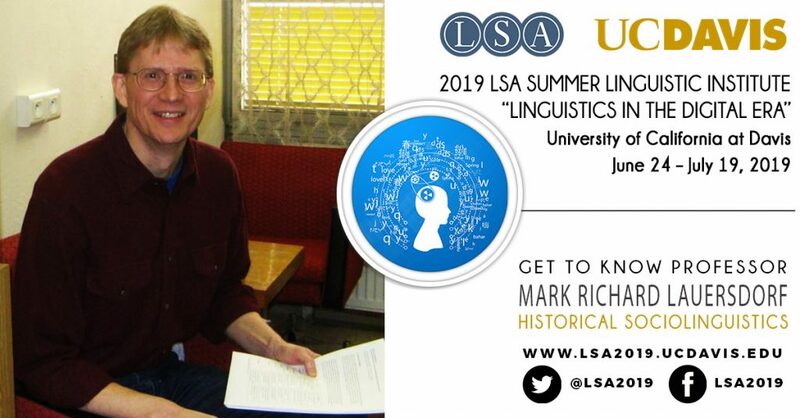 We are excited to have Mark Richard Lauerdorf from the University of Kentucky back for another round of Historical Sociolinguistics at the 2019 LSA Institute at UC Davis. The first offering of this course was at the 2017 Institute. In this interview, we learn more about Professor Lauerdorf’s course, his message to young linguists, and his interest in horticulture (which is simply perfect for Davis). I’ve always been interested in language. I have a strong memory of the July 1975 space mission where a NASA Apollo capsule and the (then) Soviet Union’s Soyuz 19 docked in space, and one of the major news magazines at the time included a brief guide to Russian phrases that one could expect to hear during the television broadcasts of the mission. As a 12-year-old kid I poured over those phrases (my first scientific linguistic analysis of a dataset!) trying to parse the Russian structures on the basis of the English translations and to work out the letter-to-sound correspondences on the basis of the layman’s pronunciation guide for the Cyrillic characters. I have held a series of different positions from the University of Kansas, to Western Oregon University, to Luther College, and now the University of Kentucky, where I teach and research in the areas of historical linguistics, sociolinguistics, language contact, and corpus linguistics, and I direct the Collaboratory for Research in Computing for Humanities. I first joined the LSA in 1991 as a graduate student and immediately began writing “Book Notices” (a now expired category of short descriptive book reviews) for the LSA’s journal Language, as a way to work my way into a professional writing and publishing regimen, and as a way of acquiring interesting new books that otherwise would have fallen beyond the reach of my graduate student book budget. I’ll be teaching the Historical Sociolinguistics course. This course was new to the line-up at the Summer Institute in 2017 and is back again for the UC Davis 2019 Institute; and I am hopeful that it will become a part of the standard offerings for the Summer Institute for years to come! Historical Sociolinguistics is a young field (generally considered to have started in the 1980s) that is vibrant and growing, and has recently acquired a North-American-based organization, the North American Research Network in Historical Sociolinguistics (NARNiHS), to help nurture and promote work in the field. – experiment with some of the digital tools of the field in our own hands-on investigations. In search of bigger, better digital datasets for data-driven corpus-based historical sociolinguistic research, I have several corpus construction projects underway involving North American English and experimentation with corpus research environments that couple rich linguistic and socio-historical annotation with quantitative and visualization methods of data analysis. We live in a neighborhood with a park, and my wife and I serve as amateur horticulturists for the neighborhood—everything from tree selection, care, and maintenance, to restoration of native environments, to soil management, to decorative landscaping design, construction, and maintenance. We also enjoy traveling, splitting our time between Europe and North America and enjoying the good music, food, culture, and friends (and, of course, languages) of many countries. In a parallel universe, I would likely be a field-based environmental scientist. As an undergraduate, I had a brief flirtation with the natural sciences, heading in my first two years of college toward a degree in physics, before turning onto the path toward linguistics. With my amateur interest in horticulture and a penchant for travel and the outdoors, environmental science seems like somewhere I might have ended up in an alternate reality. I’ve never really been to the Davis corner of California, so I am looking forward to everything the area and the Institute and the colleagues and students at UC Davis have to offer! In the choice between ice cream and cake, there is only one real winner: frosting! Cats beat dogs every time, although the dogs will always be there at your side. I’ve taught at both quarter- and semester-based institutions and find that both systems have their advantages and disadvantages. The field of linguistics is continually taking on exciting and important new dimensions and directions. Today’s graduate students should maximize their exposure to computational methods and quantitative data processing and analysis – the ability to understand what the “black boxes” of data-analytics engines are actually doing as they process the textual linguistic data that profiles us as consumers and voters and job candidates is an invaluable skill in a world that increasingly values algorithmically-drived knowledge. Untrained analysis of big data is begging for linguistically informed assistance. Grad students in linguistics should also become versed in socially-focused applications of their linguistics skills, from language documentation/revitalization to forensic linguistics to linguistics in the service of societal change. There is a growing need for highly trained language specialists to deploy their skills outside the academy, in addition to the need for the next generation of highly qualified teachers to continue the academic training that we have all benefited from.